We're about to begin actually building our theme from scratch and our first step is going to be creating our theme folder and adding a theme dot info file inside of that folder. But before we actually do that, I wanted to go over the different options that were available to us in that dot info file. So go ahead and go to your resource pack folder and we're going to open up the bat folder. This is short for build a theme and I wanted to just name this in a way that would disambiguate it from other theme functions. And if we expand it and then expand the steps folder, let's go ahead and open up the first step which is overview of info file keys. Now, if you've watched the videos on the module dot info files, the same principles will apply to the theme dot info files. The idea behind the dot info file is that it's a set of key value pairs, the key being on the left side, the value being on the right. So for example, we have the name key here and the value is bat or build a theme, and each one of these describes a setting inside of the theme. This helps Drupal use these settings in a way that can integrate with the configuration options. What I've done with this file is compiled a list based on several other dot info files of all of the possible settings that you can use in a dot info file. This way you get to see what options are available. But when we start actually implementing our dot info file, we're going ot start much simpler than this. At the very top, we have a couple of comments and if you want to add comments to our dot info file all you need to do is preface each line with a semicolon. So we have two lines of comments here. Next, we have the name of the theme. This is used in the configuration options for the theme. The same with the description. This is just a short description of what the theme is. 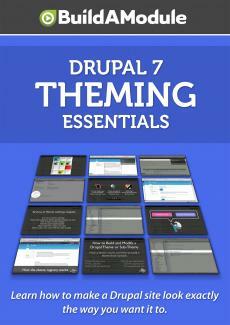 Core provides us with description of which version of Drupal this theme works for. Engine is the template engine that's being used with this theme. In 99 percent of the cases it's going to be PHP template so we don't need to really worry about this so much except that we need to add this line into our dot info file. Screenshot allows us to specify a screenshot for the configuration options for the theme. This next setting for stylesheets is a little different than the ones above. You see that there are brackets and then another set of brackets before we get to the value of the key. What this is is an array. So what we're doing here is taking the stylesheets variable. We're specifying an item inside of the stylesheets variable called all, and then we're adding new items to the stylesheets all variable bay adding empty brackets at the end of the variable. So what this does is add an additional item to this variable each time we specify it and you see it's specified four times. Now, if you look down here, we have a print item in here. So once all of these are put together inside of a single variable called stylesheets, what you'll see is two items that belong inside of the stylesheets array and then you'll see four items inside of the stylesheets all array and then 1 inside of the stylesheets print array. What this variable is for is specifying what style sheets belong where on the site. In the stylesheets all variable, these are stylesheets or CSS files that will be added to every page in the theme. With print, it's added to the document when it's prepared for printing.